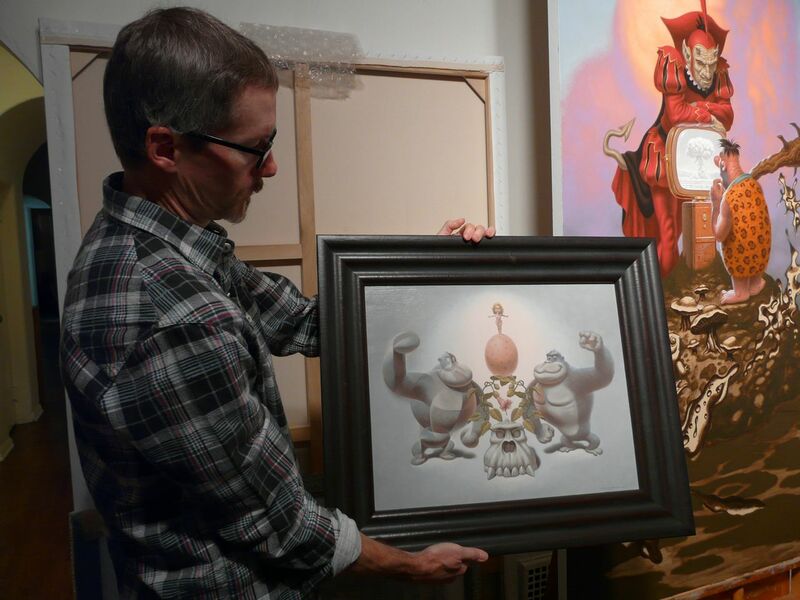 Todd Schorr: The work in this show began as an outgrowth from the large “Ape Worship” painting I worked on from 2007-2008. After completing that painting, I found I had some related ideas, also concerning apes, that I wanted to get down on canvas. Those ideas formed the basis of what would become “An Ovoid Ape,” “The Anguish Of Carl Akeley,”and “An Ape Allegory.” “When Fairy Tales Collide” and “The World We Live In” round out the show along with preliminary work for “Ape Worship.” I wanted to include the preliminary “Ape Worship” pieces as a sort of preview for the massive installation that will be part of my 25 year retrospective to take place at The San Jose Museum Of Art beginning in June. The meaning of the show’s title, “The World We Live In,” is obvious in the painting of the same name, but it also serves as a convenient blanket statement with regards to my work in general. All of my work, regardless of subject matter, touches on some aspect of shared universal truth common to our time and place. 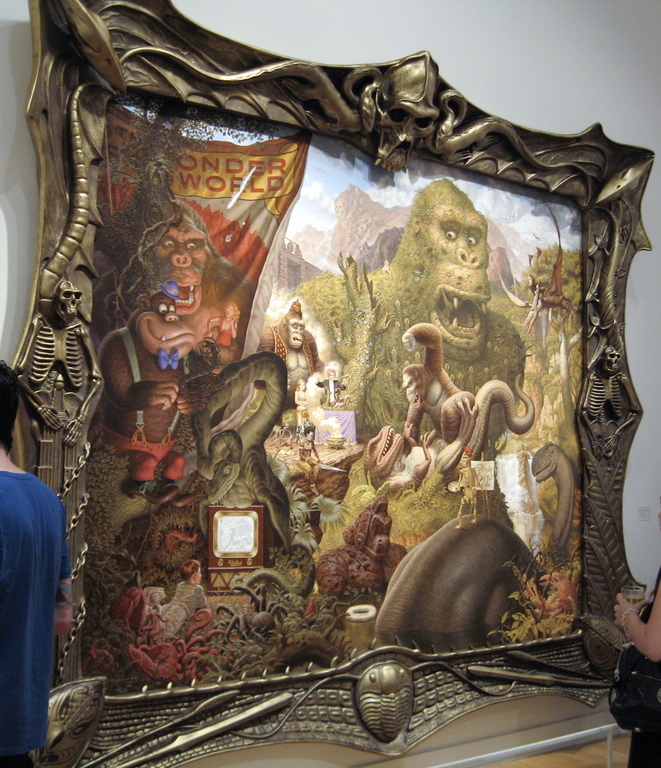 AM: The “Ape Worship” painting that was part of the “In the Land of Retinal Delights: The Juxtapoz Factor” exhibition at the Laguna Art Museum, we remember, was impressive in scale and composition. How did you feel being included in such a landmark exhibition? How important did you think an exhibition like this was for the scene and where do we go from here? Schorr: The Juxtapoz show certainly was an important milestone exhibition, and through Meg Linton’s insightful curatorial guidance, the wonderful range, depth, and importance of this art could be viewed as a collective whole. It’s one of the few small steps certain progressive museums have taken to bring this art to a wider public. The next step is to see major exhibitions of these artists in the truly hallowed halls of art like the Museum Of Modern Art in New York for instance. There is still a persistent reluctance on the part of many of these larger institutions in acknowledging this art, but I really feel they’re shooting themselves in the foot on this point, and fail to realize the broader audience this art has the potential to bring in. I recently witnessed a rather humorous situation at the Museum Of Art in New York where the gallery displaying surrealist art was jam-packed with onlookers, while the gallery containing work of recent conceptual work was occupied solely by a young mother changing the diaper of her baby infant. Does that not tell you something? AM: Speaking of museums, you have a solo retrospective exhibition coming up at the San Jose Museum of Art in June. How are the preparations coming along and what can we expect from this show? Schorr: Right now, the museum is in the process of sending out the lending agreements to the various collectors who own my work. They expect to have 40-50 paintings plus drawings, sculpture, and objects from my collections that will be included in the exhibition. 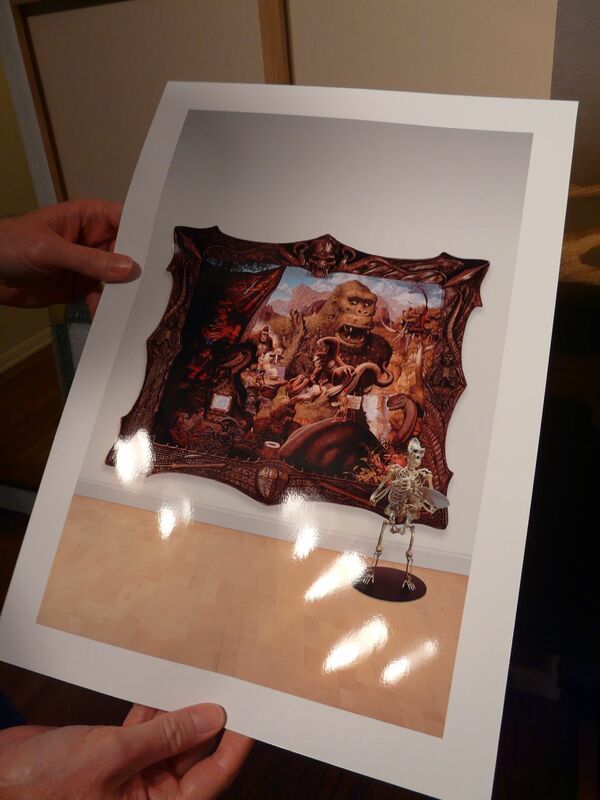 One area will be a separate enclosed installation featuring the “Ape Worship” painting and related works including a life size gold plated gorilla skeleton. I’d like to note that the “Ape Worship” painting was not planned to be a part of “The Land Of Retinal Delights” show in Laguna. 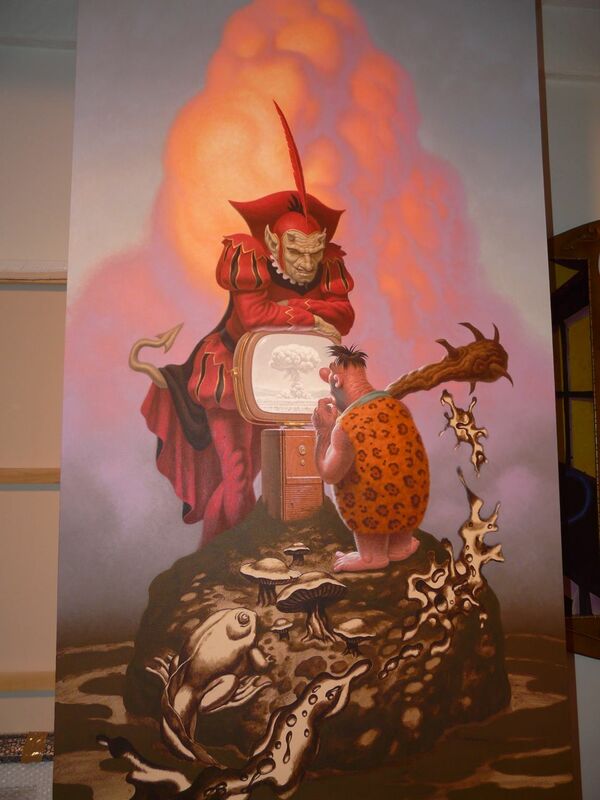 What happened was, the painting that was included in the show’s catalog, “Into The Valley Of Finks And Weirdos”, was supposed to have been the piece selected by Meg for the show. But when the collector was contacted, the crate used to ship the painting could not be located and a substitute was called for. 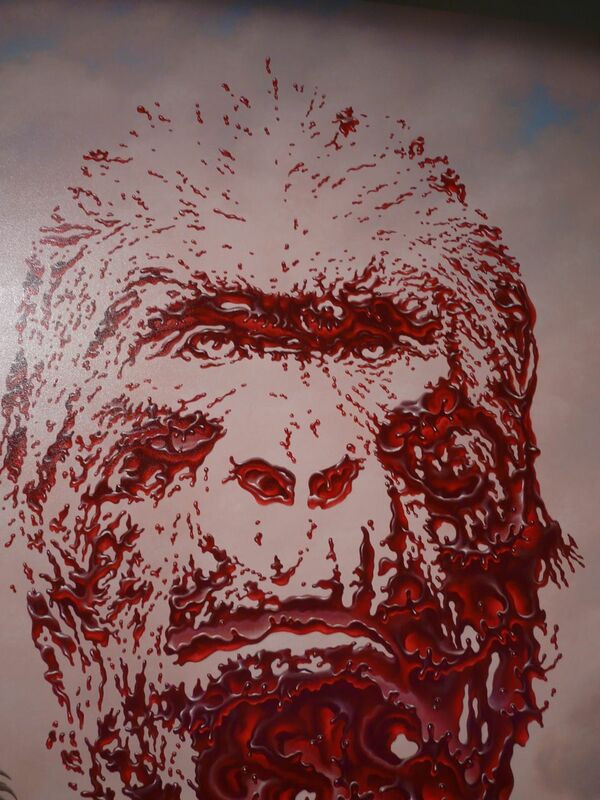 I had just completed the “Ape Worship” painting and suggested to Meg that she could sneak preview it at the Retinal Delights show. She loved the idea and that’s how that painting wound up in the exhibition but not in the show catalog. It will be seen in its full context in the installation at San Jose. AM: Many of the younger artists we talk to list you as one of their inspirations or influences. Being a dedicated artist is not easy, especially in this economic time. We know you also had some struggles when you gave up a lucrative illustration career to focus on your own personal art. Any advice for the younger generation of artists out there? Schorr: If a person has artistic inclinations and has something that by compulsion needs to be expressed, they will somehow find an outlet and hopefully be able to make a living from that talent. Unlike commercial art, where you can target the type of client or market you’d like to work for, the “fine art” gallery world is such an unpredictable mess of agendas and “of the moment” fashion posturing, that it’s folly to suggest any one path to success. However, here are a couple of important thoughts to consider. Stay true to your vision and what makes you unique while constantly seeking to evolve and improve on previous efforts. Don’t follow trends. The art world is very much tied to fashion and fads, and many young artists easily stray into these traps to gain acceptance and what they perceive as popularity. Consider yourself a very fortunate artist indeed if you manage to find just one or a couple of patrons that truly love your work and stick with you through thick and thin. AM: One of the things that people love about your work are your many references to pop culture. Can you tell us a little about the significance of this aspect of your paintings? Schorr: I consider myself a cultural anthropologist and use pop culture reference points in my work because they strike an emotional resonance with people while also forming a common pictorial language that’s accessible to just about everyone. They get the viewer’s attention and pull them into the little scenarios that I’ve laid out before them on my canvases. 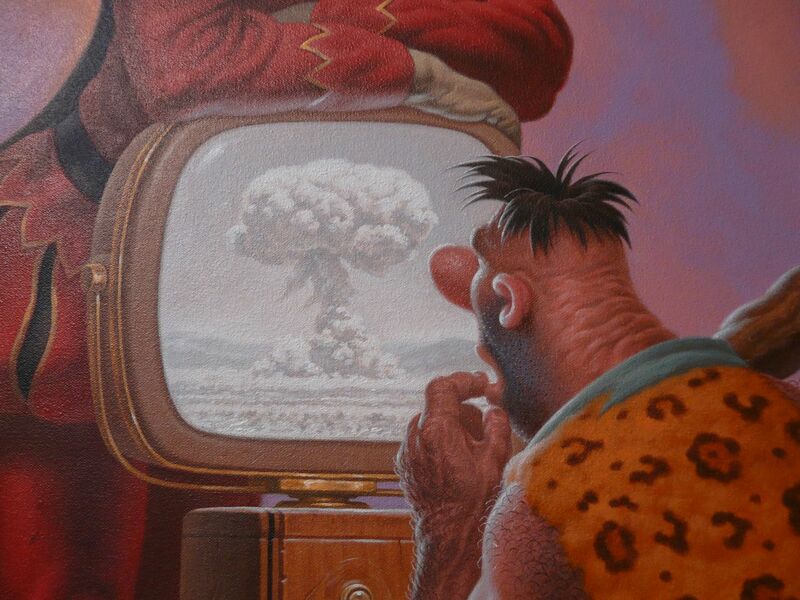 Every viewer brings their own personal perceptions to a depiction of say, Fred Flintstone, but the context he’s been placed in and how he’s been altered physically, triggers new associations in the viewer that didn’t exist before. Conversely, if a depiction of a generic cave man was used in the composition, it might not generate the same intimate emotional response. I try to get the essence of the pop culture elements I’m referring to but alter the perception of that image. AM: Other than your upcoming exhibition in San Jose, any other shows or projects you can share with us for the rest of 2009? AM: Thanks for taking time from your busy schedule to chat with us Todd. We encourage all our readers to attend the opening, hosted by David Arquette, one of Schorr’s long time collectors. There will also be limited edition giclee’s and posters available at the show with a portion of the sales benefiting Feeding America. Ape Worship image via sketchypad. Categories: Art, Features, Interviews, Low Brow & Pop Surrealism, Shows & Events. 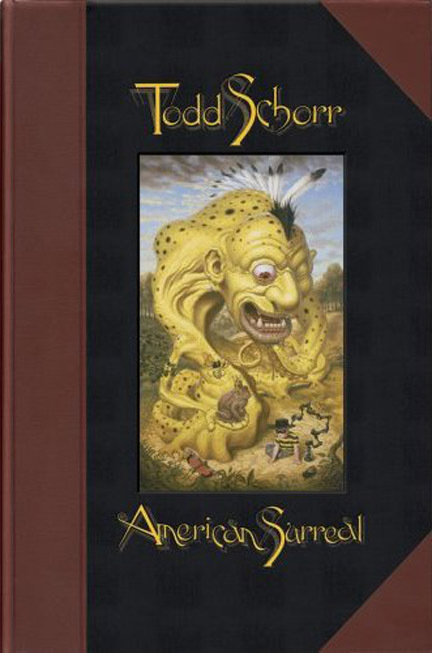 Tags: Features, Interviews, Low Brow & Pop Surrealism, Schorr - MK - 09, Shows & Events, Todd Schorr.